Rhythm was saddened to learn over the weekend that renowned US drummer Ed Shaughnessy had passed away. 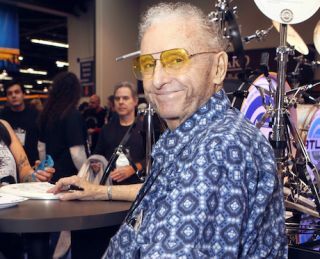 Ed, best known for his near 30-year stint at the kit for The Tonight Show, passed away aged 84 after suffering a heart attack. In tribute to Ed's lifetime of achievements at the drums, we have reproduced our last interview with Ed (originally printed in our July 2011 issue) in full below. From the 1960s through to 1992, The Tonight Show with Johnny Carson was a common denominator that united late night television viewers across the States. The wide array of guests and talent kept viewers tuning in each night to see what actor, author, musician or entertainer Johnny would have on next. Behind the familiar theme song and backing up musical guests was 'Doc' Severinson's Tonight Show Band. In the driver's seat was Ed Shaughnessy. But beyond the confines of the show, not many people knew of the rich background that Ed had within the annals of American Jazz. As a young man, Ed Shaugnessy sat in with Charlie 'Birdman' Parker. He also played with Benny Goodman, Count Basie, and Thelonius Monk. He played with Broadway shows, concert orchestras and ballet companies. He was (and still is) an avid educator and teacher. Even though he played on The Tonight Show for almost three decades, that is just one part of his drumming resume. Ed was the product of humble beginnings, growing up in Jersey City, New Jersey. From there, he went on to become one of the top drummers in New York City and to play with some of the most famous big bands and jazz musicians of that era. I drove through Los Angeles' winding network of highways, marvelling at the good fortune the traffic gods had mercifully granted me this particular morning and made my way to the quiet suburb of Calabasas. Ed Shaughnessy welcomed me into his home with a smile and a cup of hot tea. His unassuming nature and friendly demeanour disguised the fact that Ed is truly part of music history. We made our way to a comfortable couch and started talking drums and music. Ed, what was your first exposure to music growing up? "At the age of 11, I started studying piano. I used to bang a lot on pots and pans, but I didn't have any real drumming experience until my dad brought home a couple of drums. Once those drums came into the house, I had no interest in piano!" So what was your musical education like at this time? "I first started drum lessons with my boy scout master. I learned rudiments with him. When I was 15, I met a wonderful drummer by the name of Willie Sharp at a music store. He recommended me to Bill West, one of New York's best teachers. Bill taught in the middle of Manhattan. Bill also knew Gene Krupa, Buddy Rich and Louie Bellson very well. I studied with Bill for two years. I met Louie Bellson, who was very influential on my life. That's why I started playing two bass drums. He gave me another pedal and I went and found an old, used, smaller bass drum. I had a set with a 22" and I found a 20" and that started me using different sizes with my bass drums for the rest of my career. Getting a different sound, to me, was interesting. The first time I met him, he said, 'Hey Eddie, I just took some lessons with Murray Spivack on finger control. How about I show you this?' Here's an unknown kid, asking for an autograph and Louie Bellson's offering to show me an advanced drum technique out of the goodness of his heart. I felt so lucky!" "By 17 I got a job with Bobby Byrne. He was a good musician. A fine trombonist and arranger. I went out at 17 and had a great tour experience playing shows. Between learning to read with Bill West, taking books on the road and doing it, I came off that tour a good show drummer. You have to do the real thing, shows in particular. You can't get it all from just a book. "So, by 18 I had a bit of a profile. I started sitting in at the jazz clubs on 52nd Street. I had been haunting those places since I was 15. I'd go and buy a Coke and hide in a dark corner and I'd listen to Charlie Parker, Dizzy Gillespie, Ben Webster and my drumming idol at that time, 'Big' Sidney Catlett. I got to know Sid and he let me sit in once in a while. I was hooking up with younger people in New York through 52nd Street. I got the chance to sit in with Charlie Ventura, who was a great sax player. I guess he liked what I did, because a couple of months later he called me. That was my big break at the time." What opportunities did those experiences lead to? "Well, Charlie's band broke up and I went back to New York. I got a call from Benny Goodman, who wanted to make his first trip to Europe in 1950. We toured about six countries and had a great reception wherever we went. After Benny, Tommy Dorsey called me because Buddy Rich had just quit his band. I did some gigs with Tommy and made an album with him." How did your involvement with television come about? "Two weeks after my stint with Tommy ended, I got a call from CBS. The contractor had seen me play with Tommy. They told me [comedian] Steve Allen was doing a show five days a week and wanted a jazz band. He was going to have a variety of acts, so reading was important. I was 22, and I later found out that I was the youngest musician hired by a television network at the time. After I'd been at the network for about three years, the steady job stopped, but they wanted to keep me on salary. I worked with a lot of unmusical producers and it was getting to be a thankless job. I had enough confidence in my reputation that I thought I could make a living as a freelancer. I wanted to play more jazz, so I quit that job. I was making good money for that time (close to $400 a week). The jazz clubs paid $90 dollars a week. I didn't care. I did a few other jobs, but I paid my rent and I could feed myself. I was out playing a lot more jazz, which I was much happier doing. I was one of the top five drummers in New York at the time and was averaging three to six record dates a week doing a mixture of jazz and pop." What led to the Tonight Show gig? "Around 1960, many of the jazz clubs started to close. Rock'n'roll came into the clubs. We were in that transition period, where rock was the big thing and the emphasis that had been on jazz in New York was waning. I was still doing jazz clubs at night and studio dates during the day, but it was slowing down. Then, I got a call asking if I would help out The Tonight Show Band for a couple of weeks. One of the drummers had to leave for health reasons and the other drummer - they were splitting the show between two drummers - was Bobby Rosengarden. I told them that I would be glad to help them out, but I hadn't liked the gig at CBS and I didn't want something steady. After a week or so, I asked the contractor if they had a guy set up to come in after me. He said, 'No, why?' I told him that I was enjoying the job so much, I'd like to stay. He said, 'I never picked up the phone because I knew that's what was going to happen.' Originally, I turned down the job that I took for 29 years! It was an all-star band that was very heavy musically. It was a steady job and my wife and I wanted to start a family. Even up to the last week, it was fun. We played new music every day. I never got bored. Every day was a new challenge." What other gigs were you doing at this time besides The Tonight Show? "Around 1965 I got a call from Count Basie's manager. Their regular drummer, Sonny Payne couldn't come to New York due to legal reasons and Basie had a couple of albums to do. By now, I was doing The Tonight Show on a regular basis and I asked Skitch Henderson [the band leader at the time] if I could take off a couple of afternoons because I was going to record with Count Basie. Skitch said, 'If you're going to record with Count Basie, you can do whatever you want!' I played with an awful lot of people, but there was something about sitting down in the middle of the great Count Basie band that was extra special. It was one of the joys of my life." You did a drum duet with Buddy Rich on The Tonight Show in the '70s, what was that like? "We did that duet in 1978. Buddy was a friend of mine by now for quite a few years. I could talk to him. I went to his dressing room and said, 'Look, when we get out there, don't make me embarrassed. Don't pull out all your heaviest s**t! Play good, but don't play too good!' Buddy said, 'You don't have to worry, you play good too!' I said, 'Yeah, but I know what you can do when you turn it on. So we get the thing going. Buddy plays a thing, I play a thing, he plays a thing. On my second eight bars, whatever I did, I didn't do anything fancy. I moved around the drums with single strokes and it was the first time that either of us had received any applause. Buddy went into [laughs] left hand over, left hand under! He did some of his patented, hardest things that nobody else can do. We got wonderful applause at the end of the number. I said to Buddy later, 'That was fun, but what happened to our agreement? He says, 'You know, I got carried away!' [Laughs] Because, you ain't never going to play with Buddy Rich and get more applause than him!" It's been over 18 years now since Johnny Carson retired, what's music life like, post-The Tonight Show? "I was very lucky from my reputation on The Tonight Show. For a long time, it was quite a good 'hangover' of work. Colleges and jazz festivals, things like that. I always had enough work that I was happy. As I was getting older and into my seventies, I really didn't feel like travelling as much. If I had a couple of gigs a month, I stayed happy. I'd go to a school or college and do a clinic and play the concert with the band. I always practise at home and I try to drum every day. I find it keeps you in a certain place. I was still doing some travelling work with Doc [Severinsen], mostly on symphonies. Those years were very satisfying, enjoyable years. "In 2007, my wife started showing the first signs of Alzheimer's. I felt that it was time to take care of her, so I turned down all offers of travelling for the next three years. Some people called two or three times thinking I might be in a better place, and I'd say no. Everybody was always very nice. I'd work a couple of local things and I'd teach. Then, I put everything on hold from the time of my wife's death [Ed's wife Ilene, passed away 1 July, 2010]. I just didn't have the heart to do it. Now, they've all called again. I'm so grateful to them. After me turning them down two or three times. "I'm going out to the Lionel Hampton Jazz Festival in February for four days to do clinics and play. I'm going to the University of Wisconsin in April to play Basie and Ellington with a 150-piece marching band, in chairs, on stage! So, I'm startin' to gear up again!"